Whether you're on the run or in hot pursuit, Chase Cards make hectic sprints about more than just movement speeds. This beautifully illustrated deck of 51 full-colour cards gives you a new way to run chases and races in your Pathfinder Roleplaying Game adventures. Each card presents an obstacle in one of three classic adventure settings�a bustling city, a tangled forest, or a deadly dungeon�challenging heroes to overcome or fall behind. Get in the race with Chase Cards and don�t get left in the dust. By laying a line of these cards down on your table, you can track each character's progress through a path fraught with perils�along with all of the die rolls needed to avoid or navigate these unexpected dangers. 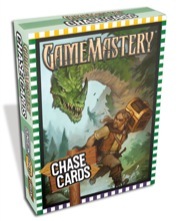 Lay out a desperate pursuit through a crowded city, a dangerous race through hostile wilderness, and a nerve-wracking run through deadly ruins and abandoned buildings�or mix and match the cards to create a chase that moves through multiple regions!